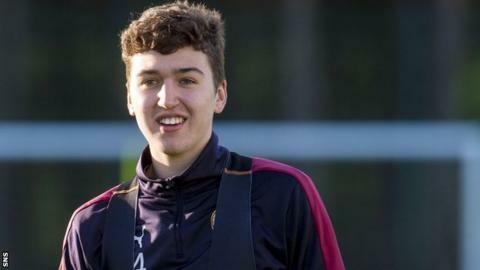 Dario Zanatta hopes that performing well for Hearts will increase his chances of being capped by Canada. The midfielder, 18, has already played twice for his country at youth level. "I've played for under-20s for Canada before, but I hope to keep on being involved with them," he said. "I just know that my club football is the most important thing for me right now. "If I get a call-up to the under-20s again, or even the older team, I will be excited." Zanatta made the move to the Scottish Premiership club after leaving Vancouver Whitecaps in the summer after deciding it was crucial if he was to realise his dream of being a professional footballer. "I've lived in Canada my whole life and played football there since I was a little boy," he told BBC Scotland. "I joined Vancouver when I was 14 and spent two or three years there before the chance came to move over to Europe. "I just found my way to Hearts and I have enjoyed it ever since." Zanatta has made six appearances from the bench for Robbie Neilson's side but has been a regular in the under-20 team at Tynecastle this season. Indeed, he is likely to feature for the development side when they face Queen of the South in the quarter-final of the Scottish Youth Cup on Sunday - 24 hours after the first team take on Inverness Caledonian Thistle. "I hope to be involved in both games, but I will just take it game by game," said Zanatta. The Canadian is also looking forward to his first Edinburgh derby the following weekend, when Hibernian travel to Tynecastle for their fifth-round tie in the Scottish Cup. "I have heard lots about it," added Zanatta. "I have watched videos of the 5-1 win [in the 2012 Scottish Cup final]. "I just hope I can be involved in it, but I am just taking it game by game at the moment. "Just because I have been involved in the first team, it does not mean I will be involved the rest of the season, so I just have to keep my feet on the ground."